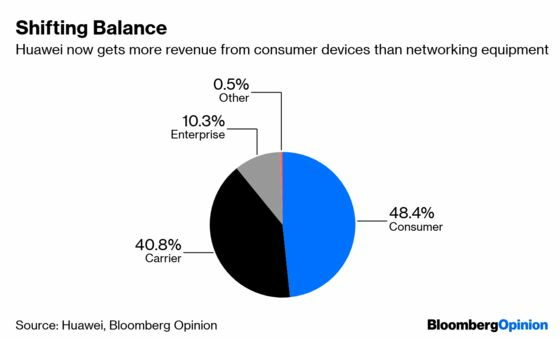 (Bloomberg Opinion) -- For all the hullabaloo about Western nations banning network equipment made by Huawei Technologies Co., the importance of that business to the Chinese company is decreasing. Sales to phone carriers slipped to 41 percent of total revenue last year, according to Huawei’s annual report. That’s the lowest portion on record. Revenue from consumer products, notably smartphones, climbed 47 percent to account for 48 percent of the total. 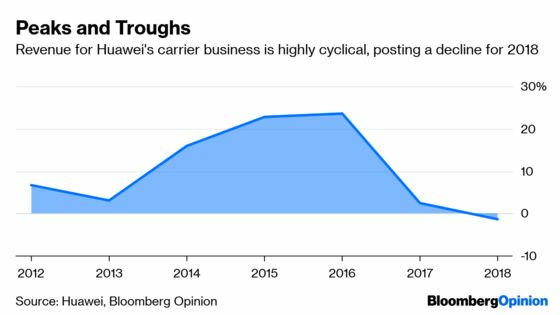 You might argue this is a chicken-and-egg situation – the carrier business slipped relative to the total because of global pressure – but in reality, the drumbeat against Huawei picked up only in the second half of 2018. Multimillion-dollar networking contracts don’t fall by the wayside so quickly. In fact, if last year’s wave of Huawei skepticism were to have an immediate impact it would have been on devices, since consumer whims shift quickly. Exceptional growth, measured in both shipments and revenue, shows that the average punter doesn’t much care about the concerns leveled at Huawei. After all, millions of them still have Facebook installed on their Google-run Android smartphones, so privacy is hardly top of mind. That’s not to say Huawei will shrug off the 1.3 percent drop in carrier revenue. Expect executives to continue their big, expensive and often ham-fisted campaign to paint themselves as the hard-done-by, misunderstood good Samaritans of the telecoms industry. Huawei’s networking-equipment business was already in somewhat of a funk before Uncle Sam came along to throw some mud, though. In 2017, growth dropped to 2.5 percent, after passing 20 percent the prior two years. That’s got more to do with timing and technology than the Wicked Witch of the West. Huawei benefited greatly from a global rollout in 4G networks, and even upgrades to 3G networks, but much of that’s been completed. Which means we’re in a lull before 5G takes off. There’s no doubt that Huawei wants an invitation to the upcoming 5G soiree. The company worked hard to win its way into 4G networks and wants to capitalize now that it has a foot in the door. It probably thought that success in 4G would give it priority in 5G, especially given that much of the company’s 4G technology isn’t easily compatible with the 5G systems of other equipment providers. This lack of interoperability earned a polite rebuke from AT&T Inc. CEO Randall Stephenson during the week. Huawei is unlikely to repeat the massive growth it posted last year in smartphone sales. Expect that to be headline news every quarter this year, with the narrative blaming a China slowdown, trade war, and international pressure. But if you take a step back and look at the broader trends in both networks and consumer handsets, you’ll see that Huawei isn’t run by fools. Its consumer device division is now bigger than the networking division. 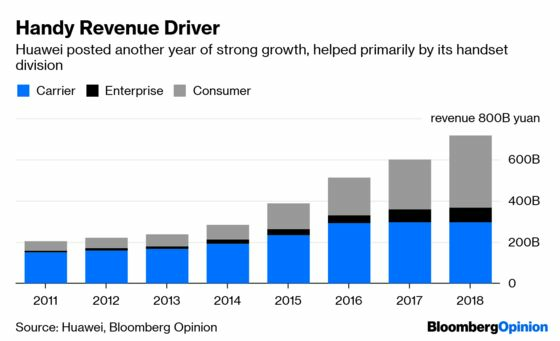 Yet growth in devices will probably slow because of global trends that are divorced from politics, which makes the coming 5G rollout the wave it needs to catch in order to provide cyclical growth. And that’s why Huawei is desperate to stay on the guest list for the only party where the drinks will be flowing freely.